To get this course at a discounted rate, please visit Groupon by clicking here. Are you considering networking as a career option and wondered what is involved or maybe those books you bought from Amazon are looking a little daunting? You may be considering a training company but don’t know which one to go to? You might be looking at our prices and be feel a bit nervous and are thinking “are we the real deal?” Well, a 1 Day Intro to Networking” course here at Commsupport is ideal so you can get a feel for us, and decide if we are good or not. On the day we will teach you the fundamentals like OSI, IP addressing, Ethernet principles, Spanning tree, VLANs as well as what are routing protocols and how do they work plus lots of other wonderful networking type stuff. We will also try to answer any of those pesky networking questions you might have had and no one to ask. 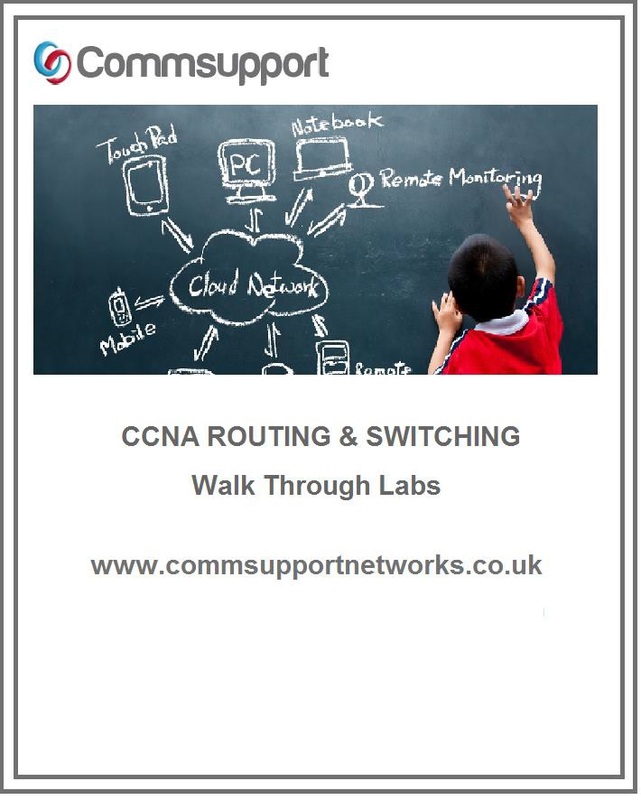 This one day course is a good foundation for our 6 day CCNA course. Come and spend the day with us and see how good (or bad) we are and see that the only cheap thing about us, are our prices! Note: you can attend the class either by coming into the class or attend the class remotely from the comfort of your homes via our Virtual Learning. What are the benefits of attending the Intro to Networking course? The course is designed to help you determine if pursuing a career in networking is for you. We want to make sure that anyone embarking on a career in networking is 100% sure that it is what they want to do. By the end of the day you will have a feel for the subjects and if they are right for you. What’s the average salary with a Network related certification? Due to the broad nature of networking, those who hold a certification like the Cisco CCNA or CCNP open up a large range of job roles all with varying salaries. The median salary is currently holding strong at an impressive £45,000 as of May 2017. At Commsupport, we know what it takes to create an expert in networking and all of our courses focus on creating a job ready specialist. A lot of training providers focus on cramming for the exam, creating candidates that know which boxes to tick under the pressure of a timer but cannot transfer their newly found knowledge into a specific job role. We always strive to take any official syllabus and place it in a real-world environment, so that all of our students become confident enough to pass the exam, all while applying this information to working examples. Throughout our classes our students gain the essential skills and knowledge to excel in the networking industry, allowing them to progress to an entry-level position or onto additional training to build their skills and increase their salary even further. Our courses are more than your ordinary courses. We really show you how things actually work using practical examples all the way through the course, so you get to remember by watching the instructor perform lots of working examples. Our students come to Commsupport knowing that they will leave with confidence that they can do the job. We know how difficult it is sometimes to choose the right book or video lectures, or in this case, course to help you break into the labyrinth that is networking. We remember the pain that we went through when we first got into networking – we did not know a gateway from a protocol. As we remember the pain, we know exactly what it takes to ensure that your introduction to networking is made as comfortable as possible and that can only be done by experts in their field. Each and every element of networking is explained in plain English, we are not in the business to bamboozle you with acronyms just to make ourselves look smart. We know our stuff and we don’t have anything to prove or show off to our students, we want you to learn and we want to take the fear away. Many of our students that have gone onto become CCNP’s and even CCIE’s, started their networking lives with us on this course. So why are you looking at taking this course? If you intend to take on the CCNA Route and Switch course and then progress up through the myriad of Cisco and other networking certifications, then you will need a solid foundation. If you think about any building or a pyramid – the stronger and wider the base determines how high the pyramid or building can go. Everyone wants to learn the real juicy networking skills on day one, but from our experience unless you have a solid foundation in the basics of how networks work then all the complex topics like Dynamic routing, Failover, filtering will be more difficult to understand and make sense of. We always encourage anyone looking to take on the 6 Day CCNA course with us otherwise the CCNA subjects can feel like climbing a mountain. If you are a project manager or in pre-sales or even just wanting to get an understanding of networking, this course will provide the necessary foundation that will stand you in good stead for years to come. Do you remember exactly that lecture you attended in the 1st year, 2nd month 3rd week of your University degree or college course? No, really why? Was the lecturer terrible? Was the lecture boring? No! Of course not. Generally, even only a few weeks later, most people can’t remember what was said during a lecture regardless of how important and interesting the subject. So you resort to your lecture notes, which at the time seemed comprehensive, neat and easy to read but now a few weeks later your notes resemble hieroglyphics. Arrghh and the panic sets in!! We solved this problem by recording each and every one of our classroom courses, so now when you finish your classroom course with us you get to keep the course forever! We are the first and only IT training company in the UK to offer this unique service. After numerous years of delivering our successful and popular instructor led classroom based training, we have gone on to now develop our very own video lectures. We don’t use off the shelf generic videos which generally gloss over details. Our recorded lectures, which are accessible for life will help you understand and learn the various technologies covered in the exams and beyond. Not only lectures, but also tons and tons of quizzes to test your knowledge. Each of the quizzes are written to test your understanding of the technologies. Pass the quizzes, watch the lectures and do all of the labs and you will be well on your way! NOW IT’S “REALLY” NEVER BEEN EASIER OR MORE AFFORDABLE TO INCREASE YOUR KNOWLEDGE AND EARNING POTENTIAL!